Look at you. 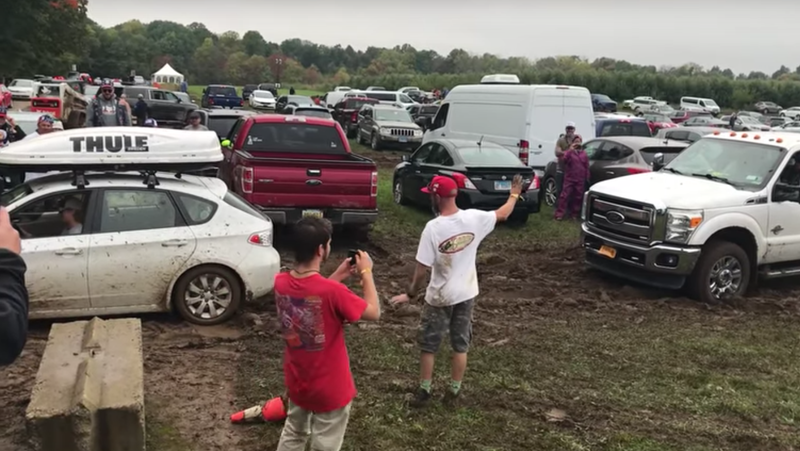 You bought a big beef boy Ford F-350 pickup truck and you can’t even get out of the muddy RedBud Motocross parking lot with it. It’s OK though, because somebody brought love in the form of a Subaru Impreza hatchback to help you out. This is less about any particular truck being bad and more just a case of a heavier vehicle on street tires going too slow through some mud and being helped by a lighter vehicle that has the traction of the grass and the benefit of never going in the mud in the first place. But it’s fun to see the crowd get excited, and the image of a hatchback pulling out a big truck is always fun. You could even call it Imprezive. Imprezive? Like, “impressive,” but an Impreza? Like the Subaru Impreza?